While the title invites a predicted round of wordplay, I will spare you the attempts at low hanging witticisms. During this past summer, I was in the throes of promoting my current book and writing my next title (which I won’t officially announce until January 2010.) As I was deep in the zero hour, I was approached by Clay Bridges Publishing to discuss my level of interest in writing the foreword for a new book on Social Media. Even though it was tempting, I maintained a fervent policy of saying “no” to anything that would distract me from my objectives. When I learned its author was Jacob Morgan, an old friend in the San Francisco Web scene, I immediately realized that no matter how preoccupied I was with my writing endeavors, I needed to push my schedule back. And, so I did…however, I did so with one request. I asked if I could share the full foreword with you once the book was published. They agreed. At the time, I was spending a beautiful long weekend in Half Moon Bay. The Pacific Ocean served as my backdrop and the warm Northern California breeze roused my focus. The book is now available. And, here I am, sharing with you a wonderful memory and hopefully an even better composition that I hope somehow helps you in your current or future venture. Social media is a humbling topic, one that I do not approach without deep study and reﬂection. On the surface, social media has democratized content, placing the power of publishing in the hands of every day people. Peeling back the collective layers, we realize something more profound however; social media has democratized and equalized inﬂuence and the ability to inspire action and establish vibrant and dedicated communities around a sense of purpose and belonging. Whether we’re consumers or brand advocates or both, we have been given a powerful gift in the form of real-time, uninhibited access to information and intelligence and the people who share their insights—the new inﬂuencers. It is how we choose to embrace this gift and as such employ it and also interact with new inﬂuencers that deﬁnes our presence and stature within the social landscape and in turn, the real world. Indeed social media is a privilege and with it comes great responsibility (and accountability). You are reading this book and therefore have made a conscious decision to learn, and for that, you’re to be commended. Social media is an elusive subject and its lessons are extensive, invaluable, and continuous. Attempting to master any form of emerging media provides us with a unique and tuned perspective that actually relegates us to a more meaningful and beneﬁcial role, one that represents practitioner, student, and apprentice. We are always learning and we do so through observation and participation. Questions are the seeds for cultivating knowledge and experience is the intelligence that serves as the curriculum for teaching and inspiring those around us. The shift from inquiry to practice is a pivotal step in earning a meaningful sense of understanding and judgment. While we never cease to ask questions, we must also immerse ourselves in the online societies that will one day beneﬁt from our strategic participation. It is not done without intelligence of course and for all intents and purposes, we are responsible for what we learn and what we earn. Our rewards are measured in relationships and reﬂective in communities and activity. Our failures are documented in the words and actions of inﬂuencers and visualized through the state of social capital and market share. At some point, we must pause our reading, limit our attendance in webinars and conferences, and set aside our fears and excuses to listen and engage to the individuals who deﬁne our communities in online networks. It’s where we learn and it’s where we begin to uncover the answers to our questions that only we could fulﬁll speciﬁc to our own realities. The study and application of emerging and interactive media is both an art and science. We have access to data, research, and academics that will provide us with an incredible knowledge base. It is our intuition and interpretation that determines our action however. This is “social” media after all and therefore, we apply ourselves as individuals and personalities in everything we do. It is what we take away from our occurrences and experiences that deﬁnes our adeptness and shapes our future participation. New media is a journey and not a destination. We grow in intellect and prowess at every stop in our ceaseless voyage. Thus, to succeed in social media requires us to study and grasp much more than what we know today. In many senses, throughout our interaction and immersion in interactive media, we become part marketer, customer service representative, publisher, connector, and digital anthropologist. We are the social architects who construct the framework for engagement and the engineers who build the roads between our stories, value, and wisdom for those seeking it. In doing so, we become the very people we sought to reach and earn a place within the communities we hoped to galvanize. And, we learn through each instance and interaction to increase our awareness and eminence within our relevant networks. Conversations are distributed across multiple social networks and real world factions. In all honestly, attention spans only continue to thin with every new network that vies for their participation. As such, we are forever in a competition to earn the attention of those whom deﬁne and direct our markets, wherever they are active today. And as countless social networks and online communities populate the social Web, at ﬁrst glance, engagement could frighten and intimidate many or otherwise seem impossible to manage and scale. It is the listening and observation that tells us everything. By searching keywords in individual social networks and also using effective listening tools and dashboards, we can reveal the exact networks where relevant trafﬁc and movement is transpiring right now. If we dive a bit deeper and view the activity through the lens of sociology and psychology, we also identify inﬂuencers, behavior, and cultures that govern each and every salient society. While social and interactive media is connected and facilitated through technology, we are, in the end, attempting to make connections with people to engender relationships and inﬂuence action and responses. We are forging connections with real people and those ties extend across networks—online and ofﬂine. If we are measured by the relationships and contacts that deﬁne our social graph, then we must visualize the constructs of the graph as it will be deﬁned less by activity within individual social networks and more through our interaction and connectedness with inﬂuencers, advocates, and stakeholders where they discover, share, and collaborate. In the process, we humanize our brand and our persona, allowing personal connections and cooperation. The Web then begins to become a much smaller and more efﬁcient platform for collaboration and communication. The minute we let conversations, both positive and negative, affect us, is the instance when we truly socialize and humanize our work. In the process we too, earn inﬂuence and thus we become much more important than we realize. Actions speak louder than words and thus, we earn the relationships, inﬂuence, and the reputation we deserve. This is your opportunity to deﬁne and create your own destiny. – Determine exactly where, who or what you strive to achieve. -Symbolize and exercise the attributes, responsibilities, and disciplines required to earn and sustain your aspirations. – Earn the very thing you were already becoming as you forced evolution through actions and outlook. This is very much our moment in which we are empowered to shape how history remembers us. Another book to add to the Library, I still like the feel of a real book. Nice review and great forward…. Great new social networking website http://goTWEETme.com allows you to invite others to tweet you. go Pretweet! Andreas, thank you…if we are not productively contributing to a meaning revolution, we are undermining it. I loved this line in particular, which really gets at the crux of the matter: “Actions speak louder than words and thus, we earn the relationships, inﬂuence, and the reputation we deserve.” I think the concept of maximizing social media is still baffling to many. It's frustrating to see people/companies simply joining these networks to meet the status quo. Jake, appreciate it…stay tuned. You'll like my next book (I hope – out in Feb). I am in my final year as a public relations student, and throughout the last six months I have begun to more proactively explore the social media world. Your blog has been one that I continue to follow and learn from. I agree with your opening statement here, that “social media has democratized and equalized inﬂuence and the ability to inspire action and establish vibrant and dedicated communities around a sense of purpose and belonging.” With the advent of all these social networks, we have all been given a voice with an equal chance of being heard – if you know how to use it. Social media can be very intimidating at first – there are so many diffrerent sites and conversations happening that you can feel very overwhelmed and lost. However, like you point out here, once you find the influencers you want to follow and determine exactly where, who or what you want to achieve, you can really appreciate and thrive on the benefits that social media has to offer. “This is very much our moment in which we are empowered to shape how history remembers us” is a powerful and inspirational thought. Thanks for your great posts. Kim, thank you. Stay with it…you're in for a wild, but wonderful ride! Great foreword. 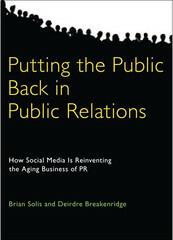 Thanks to your blog and your book, I am becoming more and more excited to enter the evolving PR world. Your ability to put everything so neatly and concisely into context is so effective. “Our rewards are measured in relationships and reﬂective in communities and activity. Our failures are documented in the words and actions of inﬂuencers and visualized through the state of social capital and market share.” Once again, thank you so much for your intelligence! Brian, This is a great foreword. I think you touched on each of the important aspects of social media. As a student, I find that many businesses are simply signing up for social sites just to hop on the band wagon, and not doing anything with them. It is such a waste of an important business opportunity. I really enjoyed this particular line “Indeed social media is a privilege and with it comes great responsibility (and accountability).” I think that many people often forget what a responsibility social media is. I think that accountability is something people are going to continue to struggle with as social media expands. Thanks for a great post! Hey Brian, can't thank you enough for contributing the forward to the book, it was definitely a pleasure to read and I'm really honored to have your name on the front cover. I really hope we can get together soon in SF, hopefully outside the chaos of one of the many events we see each other at. Inspirational. Anyone hanging on the fence deciding whether to get in on the social game need not waiver. And those already in the game, pure reinforcement. Thanks Brian. Inspirational. Anyone hanging on the fence deciding whether to get into the social game need not waiver. For those already in the game, pure reinforcement. Thanks Brian. Thanks to you Brian, I just ordered 20 copies. Thinking of giving one each to 1 500 customers. Any good deals with the Clay Bridges to be done?